I figure at this point it will be easier to do a blog post than respond to folks individually regarding the goings on here the past couple of weeks. Turned out that in a follow-up xray for the pneumonia that plagued me from Yosemite through Houston something odd was spotted on one of my ribs that required a follow up CT. This revealed that yes, indeed, something odd was growing on one of the ribs. Chances were a tumor and being unable to needle biopsy it, removal was the best course of action. So a couple of nights in the hospital between Christmas and NY. All went well and final results should be back this week. Even though the surgeon doesn’t seem like a betting sort of fellow he actually told me that “99% chance” is that it is benign. I’m holding out that NY bottle of champagne for that final confirmation. A couple of things. It hurts! They did some sort of surgical nerve block thingy which permanently cuts a section of nerves to reduce pain. Thankful for that! I guess without it I might just drive someone crazy (r). I don’t react well to strong painkillers (nausea) so have some codine with tylenol that takes the edge off. Everyday brings a change. Today being better than yesterday! I will be fine. Eventually. I am up and around. I have a couple of friends going through much much tougher crap than this and I know I am incredibly fortunate. I salute their strength and persistence! We also had a fun day at the ER on Christmas as Amma (Icelandic for Grandma) fell and broke her ankle, cracked her head and ribs. This was a couple days before my hospital visit. She is all OK -light break, head staple (out now) and ribs painful but improving. Main issue is she can’t go home. She lives in a 2nd floor apartment so she is here for the next 6 weeks for sure. Boy, when things change, they change!! The boys have cycled in and out to help but Phil is here full time to do the heavy lifting. I am indeed lucky as he is patient and a good caretaker-sometimes bossy but i’m told i’m difficult (imagine that!). So for those asking about their orders, things are a little slower than usual. But still moving along. After all, hospital bills must be paid along with the usual bunch. I even pulled out one of my favorite collected pieces to look at-I don’t think I’v shared it here (at least not in many many years). this is the inside of a silk velvet cape. special kasuri silk weaving with supplemental metallic threads. it’s a marvelous thing. every now and then i just pull it out to gape at its glory and finger its textures. Then one day I played with more of the gridded fusible that Carmen Geddes sampled me. I used it for a beaded ribbon embroidery piece I’m still working on but wondered how it might work to tame the ribbon into a more traditional use. Maggie was always after me to do something like this. Carmen was kind enough to also send me her booklet which featured a photo on the back of her and her 9 sisters. I realized why her business is called TenSisters. Quite the sweet photo! Wow, imagine ten sisters! In grabbing that link I just read that there were also 7 brothers!! Oh my! I’m looking forward to meeting her this coming year at Houston where she will be applying her skills to silk in the Silk Experience classroom. and because I always enjoy the ghost colors that come up in the discharge process of certain base colors. 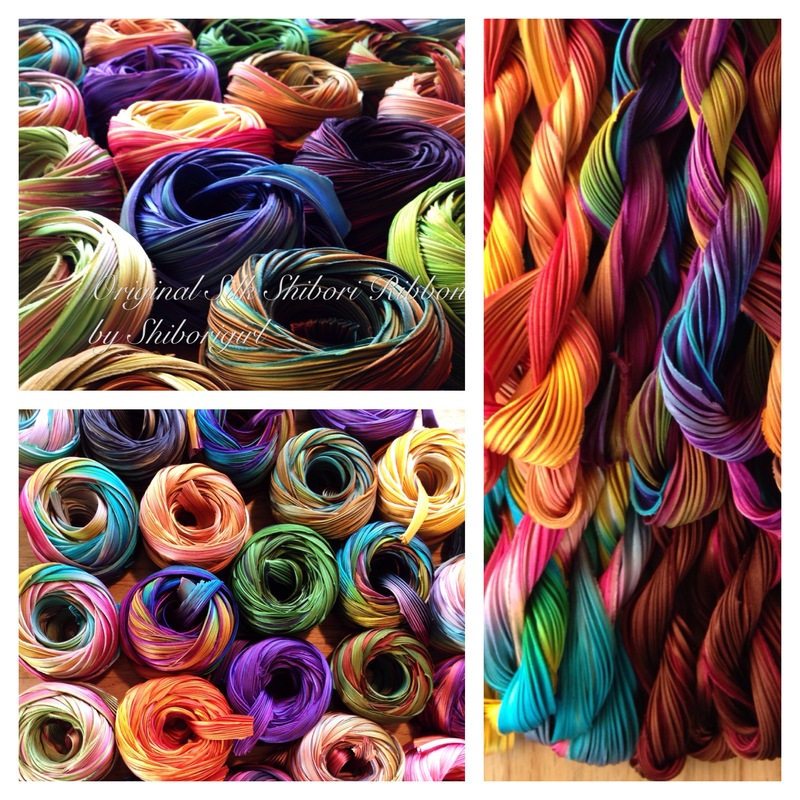 they are those colors that appear halfway up the pleat and don’t get drowned out by the overdye. not all colors have this aspect. and one more…gore-tex! in place of that pesky rib I now have some medical Gore-Tex patching me together. kinda cool stuff. inert in the body -like silk. I have really integrated textiles into my life! I have to add a couple more stories here. Not too long ago I received a thank you email from a gal who had been buying scrap bags pretty regularly. She wrote to say that she wanted to thank me for the ribbon and the dragonfly pattern as she was able to retire a size-able medical bill by making and selling the shibori ribbon dragonfly pins. she also worked up a butterfly design as well and both had contributed to freeing herself from this burden and she was doing well. How great is that? Then, the afternoon of my surgery I was resting in my room and received a wonderful new years note from Wendy with a child’s thank you for some of my pieces that are used in her therapy work. She told of coming to know the color blue even though she can’t see it and the way she maps life through the textiles. Who is healing who here? This entry was posted in experimenting, inspiration, mending, quilting, shibori, shibori ribbon and tagged arashi shibori, houston quilt festival, mending, silk shibori ribbon on January 5, 2016 by shiborigirl. Beautiful stories at the end of this post brought tears to my throat. Many blessings that you continue to heal. Be gentle with yourself and accept the kindness of others. Sending healing blessings your way. Thank you for the inspirational stories. It goes to show the ” butterfly” or “ripple” effect we all have in the universe. Positive thought, Positive work, Positive deeds can heal many. oh i had no idea all the medical stuff that was happening. your post is uplifting and positive. keep healing and get stronger. and what a great guy Phil is…..
akemashite omedetou gozaimasu jan san! 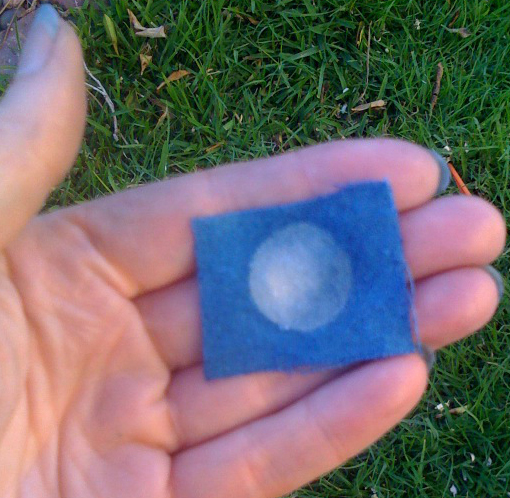 Thanks for the blog, Shibori Girl. I know resting and recouperating is intensely annoying and boring for us creative types, but I’m so glad you’re seeing progress from day today. Love your work and the images you post; it’s truly an inspiration to me. not boring really. I can always find something to engage with. upward from here! Thank you for connecting the dots and being forthcoming about your health. Not that far away if there is anything I may do for you — as one very independent person to another — do not hesitate to ask. My goodness! 2015…WTF. Fervently hoping and appealing to the Powers That Be that 2016 is a much healthier year for you and all the beloveds. Glennis: Just got your latest blog with the news of your recent ‘hospital bout’. Wow , do hope you heal fast and find some good conclusions to your suffering. Will get back to you soon, we have been gone for a few days and having telephone problems that must be resolved. Hang in and take care. Just catching up on blogs…sorry to hear you’ve been not well and hope for a speedy recovery.